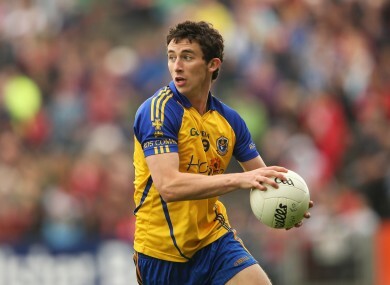 Roscommon's Colin Compton was the star of the show for Garda College today. ROSCOMMON’S COLIN COMPTON was the star of the show as Garda College claimed victory over St Pat’s (Drumcondra) in yesterday’s Trench Cup final at the Mardyke. Compton caused huge problems for the St Pat’s rearguard throughout while Peter McGee, a brother of Donegal senior defenders Neil and Eamon, bagged the only goal of the game at a crucial stage in the second-half. Dublin duo Cormac Costello and Ciaran Kilkenny lead the way in the scoring stakes for St Pat’s but Garda College’s defence did a fine job in marshalling that duo with the deployment of Kerry’s Matthew Galvin as a sweeper helping in that regard. Costello missed a penalty with five minutes left when he drilled a shot wide and that was the end of St Pat’s hopes of staging a comeback. Garda College laid the foundations in the opening quarter as they went into a 0-5 to 0-1 lead by the 23rd minute. Compton was excellent while they were also unlucky not to bag two goals when James Corkery’s shot was expertly saved by St Pat’s goalkeeper Danny Curry while St Pat’s defender Ciarán Brady did brilliantly on another occasion to scramble the ball off the line. St Pat’s finished the half strongly with Costello, Kilkenny and Hugh McFadden notching fine points to leave it 0-5 to 0-4 in favour of Garda College at the interval. But St Pat’s quickly resumed their dominance in the second-half with Compton rattling off three points and then McHugh charging through for a fine goal in the 40th minute. St Pat’s tried manfully to get back into contention with a couple of Kilkenny points from frees and one from Costello leaving them 1-12 to 0-8 adrift with five minutes left. Their best chance of hitting the net came when Costello was fouled then for a penalty but his low shot went wide. Garda College closed out the game with a Compton free helping to seal a six-point win. Scorers for Garda College: Colin Compton 0-8 (0-4f), Peter McGee 1-0, Seamus Corcoran 0-2, Paul Smith, Ivor Whyte, Padraig Scott 0-1 each. Scorers for St Pat’s: Cormac Costello 0-4 (0-3f), Ciaran Kilkenny 0-3 (0-2f), Hugh McFadden, Kevin Kindlon, Ronan Daly 0-1 each. - This article was originally published on 21 February at 2.32pm. Email “Roscommon's Compton the scoring star as Garda College win Trench Cup against St Pat's”. Feedback on “Roscommon's Compton the scoring star as Garda College win Trench Cup against St Pat's”.